"What you write after two a.m.," he said after a long pause, "is complete nonsense." He was trying to make sense of it anyway, staring fixedly at the screen, the blanket he had brought for Nihlus completely forgotten. Nihlus sighed. You win some, you lose some. Coloured with a fricking mouse. Guess how late i stayed up for this? Cookies for pointing out what's on each screen. Mass Effect and will be the death of me. Can you please explain their genders to me cause i can't tell. Nice job and super cute! What did you use coloer this? You've got to give it to photoshop. It has come a relylong way! ...though my wrists would prefer to disagree. Very nice work! I'm in love with Nihlus' facial angle. Agreed like you have no idea. Lovely, lovely! One of the most memorable things I've seen here. Love your Saren, love his clothing, love the touch. Love how Nihlus is looking up to him. Do you suppose there could have been real tenderness between them, whether friendly, or more-than-friendly, given their... ending? Heart breaks every time I think of it. You did a great job with the screens, they look totally science-like, all with the bell curve and the code listing and the integrals, hehe, it's just great. *Blushes very hard. * Thank you. Underserved praise, right there. Here's the thing: I really can't comment on your technique, because I know next to nothing about painting (well, I hope I know how to appreciate it!) - but there's so much heart in this one, it's just staring at me, you know? It's full of meaning and feeling. Maybe not everyone could relate, it's specific to the characters, and many people don't exactly harbor mushy feelings for Saren. I so do. And I so know what you mean by a *lot. * What can I say? Me too. Tell me one thing... was the "Cookies for pointing out what's on each screen" thing there last night or did you add it in the meantime? Because I totally missed it, I swear. If I saw it, I'd pay more attention! Venturi tube, huh. I though you took the lower gaussian and mirrored it, hehe. The cookies thing was always there. But i forgot, so here. *Hands you a freshly-baked platter*. And yeah, now it totally looks like a gaussian distribution to me. As for mushy feelings, well... i daresay i have a little bit of that. Okay, maybe much more. I think it's the strength of his will (both in service of and against, if Paragon'd, Sovereign) that's really attractive. What about you? Oh, and thanks for the watch. Appreciated! Me, I like Saren because he's the kind of cerebral, impossibly confident person who can make you eat your own tongue, who you can't beat in a debate, who wins the war first, and then goes to battle. His logic is infallible; but when he realizes he's been building it on top of all the wrong axioms, he falls apart. Suicide-Saren is my only canon-Saren. The two moments when he grew on me were: 1) when he related his ambition to the wellbeing of his people (ending of Revelation; whether total supremacy counts as wellbeing is another story, heh) and 2) when he was portrayed as the less extreme, less intense, less villainy character next to Desolas. Nowadays I'm just sad for him, almost as sad as I'm for Nihlus. Sigh. Haha, I don't know what that phrase means either, I kinda made it up as I went. Not sure if Nihlus could forgive. It depends on Saren's motives. If he killed Nihlus because of the obvious - you like humans, you'll try to stop me, you might even succeed, so you need to die - than no, I don't think Nihlus would forgive. If there was something more... maybe. Yes, yes i do. The original painting is nice too. Mm... what about 'you're young, relatively innocent, and carefree; if i let you live, Sovereign will have you in its clutches sooner or later because you'll try to investigate me; so Spirits forgive me for saving you from a short and painful life under indoctrination'? 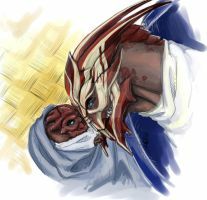 I wasn't a Saren/Nihlus shipper before I saw this pic. Now... I think I might be. It's not my job to indoctrinate people to this pairing... but hooray? d'awwwwwwwwww! this is just brilliantly cute. Hah, he does have a point there ... then again, sometimes you don't have a choice if you're ordered to burn the midnight oil, do you? Lol, mouse colouring is hard, isn't it? I did that too for about 18 months before switching to a tablet. Hmm those look like equations of some kind ... too horrifying for me to even take a guess at. Lol! I bet. Isn't that why there are like autopilots and stuff on starships, so you won't have to bother with all that crap anymore? Ah, to live in the future. I love candid images of non party charecters, and I like the 'Saren was not always the badguy' speculation type images. Well for being colored with a mouse, that looks really fricken good! is that math and C language? yeah, math--you get a cookie. hmmm, don't know why I has the impression it was some sort of programming language. This is awesome. I love Saren being sweet to Nihlus and bringing him a blanket. (I'm somewhat of a Saren/Nihlus shipper ) Seriously though, this is really good. loudest whisper i've ever heard.